Final of the National Championships under 16 in 1997. Junior tennis in Albania was inexistent from 1940 to 1990. With the new Federation of the 90's Juniors began to play tennis. The cooperation of the Federation with ITF and ETA started a new era for Junior Tennis. Juniors ( 14-16) began to play in European Tournaments. National activities reached a higher value, because the winners would compete with other countries. Also, Junior tennis in Albania is strongly supported and subsidized by ITF and ETA. Without their help playing tennis in Albania would be a real hell. All good players receive racquets, strings and balls free during the year, a donation by these major world organizations. But still Junior tennis in Albania is only spread in Tirana. For this purpose the coach has a project to spread tennis nationwide (see Activities). 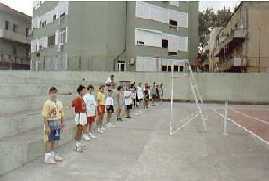 In 1999 the first under 12 tournament was held in Tirana. This was a great satisfation for the Federation. Similar tournaments will continue in the next years and a regular National Championships under 12 is in the calendar of the Federation. 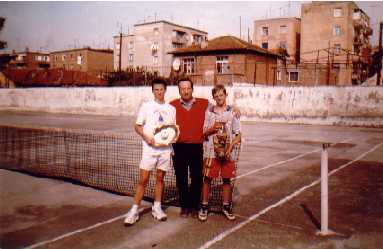 If you want to learn to play tennis in Albania please click here.